Brandon Sanderson’s first story collection: novellas and short stories set in the Shardworlds, the worlds of Stormlight, Mistborn, Elantris, and more. Arcanum Unbounded is an anthology of classic and epic proportions from a true Fantasy genius which was full to the brim of Brandon Sanderson’s Cosmere universe. The book followed characters we all know and love and plenty of new characters to fall for – Dusk, I’m looking at you. The book is divided up into “systems” with a neat little explanation as to the layout of each system; which is then related to a specific setting from the Cosmere – Elantris, Mistborn, Threnody, First of the Sun and a previously unnamed and unpublished Stormlight Archive novella. I don’t want to go into too much detail about the individual shorts for those of you who have not read any the related systems books – (you have to!) – but each story gave a wonderful insight into the characters points of view and their unique history. My favorites of this anthology would have to be The Emperor’s Soul, Sixth of the Dusk and Edgedancer. They each brought a little something special to this book – Emperor’s Soul took me right back to Elantris, the first ever Sanderson book I read and still my favorite to this day; Sixth of the Dusk had this overwhelming silence to it even when the characters involved were speaking (though this was few and far between in fairness) and this silence across the characters when Brandon’s characters usually talk so much was brilliantly done. Edgedancer was a book in The Stormlight Archive system, though I’m slightly ashamed to admit I haven’t read all of The Stormlight Archive books yet, but I have them and this gave spoilers into The Words of Radiance (book 2 of the series so far) these spoilers are not really spoilers to me, maybe once I’ve read Radiance it will make a difference but my first read through made no spoilery difference to me. Each individual short in the system was preceded by a little spoiler warning if there would be one, or a note stating where in the story arc it falls and was then followed by a sweet little Postscript from Brandon – each one tailor made for its preceding event; the best postscript was for The Hope of Elantris but I won’t give anything away, you had to read it. 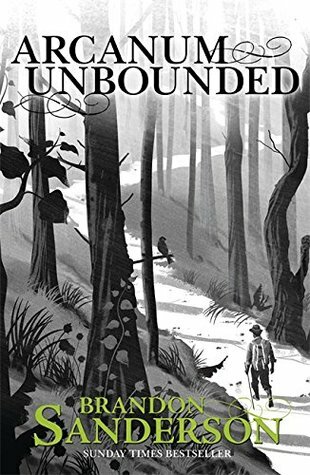 Overall, Arcanum Unbounded is a perfect book to dive into Brandon Sanderson’s work as few of the stories in it actually need to be read before the main story – Mistborn: A Secret History, The Hope of Elantris, Edgedancer for definite. If you’re looking for a new fantasy author to sink your teeth into Brandon Sanderson is your man.